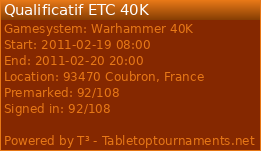 The 40K Tournament of the Tour D'ebene will now take place on the 29th of May! Change the date in your agendas and let the organisers know if the new date doesn't suit you please! New Ranking Der Nederlanden website! The Ranking Der Nederlanden have launched a new website. Go visit it and find out more by Clicking Here!